The earliest evidence of African-American art in the United States is the work of skilled craftsmen slaves from New England. Two categories of slave craft items survive from colonial America: articles created for personal use by slaves and articles created for public use. Examples from the period between the 17th century and the early 19th century include: small drums, quilts, wrought-iron figures, baskets, ceramic vessels, and gravestones. Many of Africa’s most skilled slave artisans were hired out by slave owners. With the consent of their masters, some slave artisans also were able to keep a small percentage of the wages earned in their free time and thereby save enough money to purchase their, and their families', freedom. The public works of art produced by slave craftsmen were an important contribution to the Colonial economy. In New England and the Mid-Atlantic colonies, slaves were apprenticed as goldsmiths, cabinetmakers, engravers, carvers portrait painters, carpenters, masons and iron workers. The construction and decoration of the Janson House built on the Hudson River in 1712 was the work of African-Americans. Many of the oldest buildings in Louisiana, South Carolina and Georgia were built by craftsmen slaves. In the mid-eighteenth century, John Bush was a powder horn carver and soldier with the Massachusetts militia fighting with the British in the French and Indian War. Patrick H. Reason, Joshua Johnson, and Scipio Moorhead were among the earliest known portrait artists, from the period of 1773–1887. Patronage by some white families allowed for private tutorship in special cases. Many of these sponsoring whites were abolitionists. The artists received more encouragement and were better able to support themselves in cities, of which there were more in the North and border states. Harriet Powers (1837–1910) was an African-American folk artist and quilt maker from rural Georgia, United States, born into slavery. Now nationally recognized for her quilts, she used traditional appliqué techniques to record local legends, Bible stories, and astronomical events on her quilts. Only two of her late quilts have survived: Bible Quilt 1886 and Bible Quilt 1898. Her quilts are considered among the finest examples of 19th-century Southern quilting,. Like Powers, the women of Gee's Bend developed a distinctive, bold, and sophisticated quilting style based on traditional American (and African-American) quilts, but with a geometric simplicity. Although widely separated by geography, they have qualities reminiscent of Amish quilts and modern art. The women of Gee's Bend passed their skills and aesthetic down through at least six generations to the present. At one time scholars believed slaves sometimes utilized quilt blocks to alert other slaves about escape plans during the time of the Underground Railroad, but most historians do not agree. Quilting remains alive as form of artistic expression in the African-American community. After the Civil War, it became increasingly acceptable for African American-created works to be exhibited in museums, and artists increasingly produced works for this purpose. These were works mostly in the European romantic and classical traditions of landscapes and portraits. Edward Mitchell Bannister, Henry Ossawa Tanner and Edmonia Lewis are the most notable of this time. Others include Grafton Tyler Brown, Nelson A. Primus and Meta Vaux Warrick Fuller. The goal of widespread recognition across racial boundaries was first eased within America's big cities, including Philadelphia, Boston, Chicago, New York, and New Orleans. Even in these places, however, there were discriminatory limitations. Abroad, however, African Americans were much better received. In Europe — especially Paris, France — these artists could express much more freedom in experimentation and education concerning techniques outside traditional western art. Freedom of expression was much more prevalent in Paris as well as Munich and Rome to a lesser extent. The Harlem Renaissance was one of the most notable movements in African-American art. Certain freedoms and ideas that were already widespread in many parts of the world at the time had begun to spread into the artistic communities United States during the 1920s. During this period notable artists included Richmond Barthé, Aaron Douglas, Lawrence Harris, Palmer Hayden, William H. Johnson, Sargent Johnson, John T. Biggers, Earle Wilton Richardson, Malvin Gray Johnson, Archibald Motley, Augusta Savage, Hale Woodruff, and photographer James Van Der Zee. 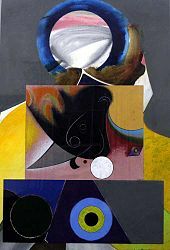 Midnight Golfer by Eugene J. Martin, mixed media collage on rag paper. The US Treasury Department's Public Works of Art Project ineffectively attempted to provide support for artists in 1933. In 1935, President Franklin D. Roosevelt created the Works Progress Administration (WPA). The WPA provided for all American artists and proved especially helpful to African-American artists. Artists and writers both gained work that helped them survive the Depression. Among them were Jacob Lawrence and Richard Wright. Politics, human and social conditions all became the subjects of accepted art forms. Important cities with significant black populations and important African-American art circles included Philadelphia, Boston, San Francisco and Washington, D.C. The WPA led to a new wave of important black art professors. Mixed media, abstract art, cubism, and social realism became not only acceptable, but desirable. Artists of the WPA united to form the 1935 Harlem Artists Guild, which developed community art facilities in major cities. Leading forms of art included drawing, sculpture, printmaking, painting, pottery, quilting, weaving and photography. By 1939, the costly WPA and its projects all were terminated. In the 1950s and 1960s, few African-American artists were widely known or accepted. Despite this, The Highwaymen, a loose association of 26 African-American artists from Fort Pierce, Florida, created idyllic, quickly realized images of the Florida landscape and peddled some 200,000 of them from the trunks of their cars. In the 1950s and 1960s, it was impossible to find galleries interested in selling artworks by a group of unknown, self-taught African Americans, so they sold their art directly to the public rather than through galleries and art agents. Rediscovered in the mid-1990s, today they are recognized as an important part of American folk history. The current market price for an original Highwaymen painting can easily bring in thousands of dollars. In 2004 the original group of 26 Highwaymen were inducted into the Florida Artists Hall of Fame. Currently 8 of the 26 are deceased, including A. Hair, H. Newton, Ellis and George Buckner, A. Moran, L. Roberts, Hezekiah Baker and most recently Johnny Daniels. The full list of 26 can be found in the Florida Artists Hall of Fame, as well as various highwaymen and Florida art websites. After the Second World War, some artists took a global approach, working and exhibiting abroad, in Paris, and as the decade wore on, relocated gradually in other welcoming cities such as Copenhagen, Amsterdam, and Stockholm: Barbara Chase-Riboud, Edward Clark, Harvey Cropper, Beauford Delaney, Herbert Gentry, Bill Hutson, Clifford Jackson, Sam Middleton, Larry Potter, Haywood Bill Rivers, Merton Simpson, and Walter Williams. Some African-American artists did make it into important New York galleries by the 1950s and 1960s: Horace Pippin, Romare Bearden, Jacob Lawrence, William T. Williams, Norman Lewis, Thomas Sills, and Sam Gilliam were among the few who had successfully been received in a gallery setting. The Civil Rights Movement of the 1960s and 1970s led artists to capture and express the times and changes. Galleries and community art centers developed for the purpose of displaying African-American art, and collegiate teaching positions were created by and for African-American artists. Some African-American women were also active in the feminist art movement in the 1970s. Faith Ringgold made work that featured black female subjects and that addressed the conjunction of racism and sexism in the U.S., while the collective Where We At (WWA) held exhibitions exclusively featuring the artwork of African-American women. By the 1980s and 1990s, hip-hop graffiti became predominate in urban communities. Most major cities had developed museums devoted to African-American artists. The National Endowment for the Arts provided increasing support for these artists. Important collections of African-American art include the Walter O. Evans Collection of African American Art, the Paul R. Jones collections at the University of Delaware and University of Alabama, the David C. Driskell Art collection, the Harmon and Harriet Kelley Collection of African American Art, the Schomburg Center for Research in Black Culture, and the Mott-Warsh collection. Textile artists are part of African-American art history. According to the 2010 Quilting in America industry survey, there are 1.6 million quilters in the United States. Influential contemporary artists include Larry D. Alexander, Laylah Ali, Amalia Amaki, Emma Amos, Jean-Michel Basquiat, Dawoud Bey, Camille Billops, Mark Bradford, Edward Clark, Willie Cole, Robert Colescott, Louis Delsarte, David C. Driskell, Leonardo Drew, Mel Edwards, Ricardo Francis, Charles Gaines, Ellen Gallagher, Herbert Gentry, Sam Gilliam, David Hammons, Jerry Harris, Joseph Holston, Richard Hunt, Martha Jackson-Jarvis, Katie S. Mallory, M. Scott Johnson, Rashid Johnson, Joe Lewis, Glenn Ligon, James Little, Edward L. Loper, Sr., Alvin D. Loving, Kerry James Marshall, Eugene J. Martin, Richard Mayhew, Sam Middleton, Howard McCalebb, Charles McGill, Thaddeus Mosley, Sana Musasama, Senga Nengudi, Joe Overstreet, Martin Puryear, Adrian Piper, Howardena Pindell, Faith Ringgold, Gale Fulton Ross, Alison Saar, Betye Saar, John Solomon Sandridge, Raymond Saunders, John T. Scott, Joyce Scott, Gary Simmons, Lorna Simpson, Renee Stout, Kara Walker, Carrie Mae Weems, Stanley Whitney, William T. Williams, Jack Whitten, Fred Wilson, Richard Wyatt, Jr., Richard Yarde, and Purvis Young, Kehinde Wiley, Mickalene Thomas, Barkley Hendricks, Jeff Sonhouse, William Walker, Ellsworth Ausby, Che Baraka, Emmett Wigglesworth, Otto Neals, Dindga McCannon, Terry Dixon (artist), Frederick J. Brown, and many others. The earliest evidence of African-American art in the United States is the work of skilled craftsmen slaves from New England. Sewing, weaving, and quilting are all different forms of art and tradition to learn as a young Black women. “The skilled fabrication of functional and aesthetic objects has long been within their domain.” These art forms play a major role in past and present society of a Black women. Another art form that we see a lot of today is, cornrows. Cornrows or braids, also called canerows in the Caribbean, are an ancient traditional African style of hair grooming, in which the hair is braided very close to the scalp, using an underhand, upward motion to produce a continuous, raised row. Men and women can both wear cornrows. The tradition of female hairstyling in cornrows has remained popular throughout Africa, particularly in the Horn of Africa and West Africa.Historically, male styling with cornrows can be traced as far back as the early nineteenth century to Ethiopia, where warriors and kings such as Tewodros II and Yohannes IV were depicted wearing cornrows. Cornrows hairstyles in Africa also meet a wide social domain of religion, kinship, status, age, ethnicity, and other attributes that can be express by a hairstyle. During slavery, braids were often used to relay messages between slaves. They signaled that they were either going to escape. Or even used it for luxuries, such gold and seeds. Women slaves were initially perceived as a lesser threat. Because of this advantage they would hide symbols and items in their hair that would mean various things. Some African-American women were also active in the feminist art movement in the 1970s. Faith Ringgold made work that featured black female subjects and that addressed the conjunction of racism and sexism in the U.S., while the collective Where We At (WWA) held exhibitions exclusively featuring the artwork of African-American women. Many modern day artist styles contained a purpose. Whether it was for a movement or personal beliefs, their artwork served as a message, a way to let the world to know how they felt. A Lot of modernization painting reflect the past in some way, shape or form. If that was a positive or negative reflection, that’s was up to solely the artist. Kara Walker, a contemporary American artist, is known for her exploration of race, gender, sexuality, violence and identity in her artworks. Walker's silhouette images work to bridge unfinished folklore in the Antebellum South and are reminiscent of the earlier work of Harriet Powers. Her nightmarish yet fantastical images incorporate a cinematic feel. In 2007, Walker was listed among Time Magazine's "100 Most Influential People in The World, Artists and Entertainers". Walker is one of those artist that uses her platform so her thoughts and words are acknowledged. The Material Girls are a group of artists known as Chakaia Booker, Sonya Clark, Torkwase Dyson, Maya Freelon Asante, Maren Hassinger, Martha Jackson Jarvis, Joyce J. Scott, and Reneé Stout. “Material Girls is a refreshing departure from group exhibitions of African American artists based largely on their racial designation, with little or no additional binding or critical structure.” Mounted by the Reginald F. Lewis Museum in Baltimore, Maryland and curated by Michelle Joan Wilkinson, the group exhibition highlights the traditional and nontraditional media of these artists. The exhibition includes work by Maren Hassinger. The section is dominated by Hassinger’s evocative installation LOVE, consisting of delicate pink plastic bags in a narrow pyramidal formation attached to the intersection of two walls. A collection of combs and a wreath of human hair round out the first part of the exhibition, contributed by the intriguing Sonya Clark. Torkwase Dyson, Joyce J. Scott, and Reneé Stout are featured in the last part of the exhibition space. These women fashion materials in a narrative and figurative manner; often drawing upon African spiritual practice and ritual material culture. Eshu Elegba, Dyson, Scott, and Stout take a decidedly figurative approach in their various modes of expression. “The importance of African cultural production as a source -- a critical thematic thread of this exhibition -- is embodied in Scott’s Inkisi: St. John the Conqueror.” This collection of glass bottles, beads, wire, and coral responds to the corporeal structure and ideology of in the nkisi, a ritual object from the Central African Kongo peoples. Scott’s Inkisi, a doll-like figure shrouded with small bottles filled with red coral “roots” invokes the Kongo nkisi as power object, healer, and a container of spirits while maintaining the mischievous decorative quality of the beads and coral embellishment. Even though the Material Girls displayed a museum of union and collaboration, that wasn’t always the case. The Black Arts Movement shows us that. The movement has been seen as one of the most important times in African-American literature. It inspired black people to establish their own publishing houses, magazines, journals and art institutions. It led to the creation of African-American Studies programs within universities. The movement was triggered by the assassination of Malcolm X. Among the well-known writers who were involved with the movement are Nikki Giovanni, Sonia Sanchez, Maya Angelou, Hoyt W. Fuller, and Rosa Guy. The Black Arts Movements of the 1960s signaled one of the greatest advancements of African American visual art in history, black women artists were underrepresented at the onset of the movement. These individual artist named Elizabeth, Catlett, Faith Ringgold, Camille Billops, Ingle Hardison, Lois Mailou Jones, and Betty Saar were gaining a national level, the majority of working black women artists in New York were not exhibited in either major or black-owned galleries. The spring of 1971 was the year that black women artists as a whole began to finally make a breakthrough. An artist who goes by the name of Kay Brown developed a philosophy based in African tradition and the cooperative gallery experience to present to artists Dindga McCannon, Faith Ringgold and others as they discussed the possibility of a major exhibition of black women artist in 1971. ^ Sharon F. Patton, African-American Art, Oxford University Press, 1998. ^ a b Lewis, Samella (2003). African American Art and Artists. University of California Press. ^ Romare Bearden, Harry Henderson, A History of African-American Artists. From 1792 to the Present. New York: Pantheon Books, 1993. ^ USA Today Magazine. May2005, Vol. 133 Issue 2720, p48-52. 5p. ^ Kyra E. Hicks (2009), This I Accomplish: Harriet Powers' Bible Quilt and Other Pieces. ^ The Quilts of Gees Bend. ^ The Highwaymen Archived 2007-10-18 at the Wayback Machine By Ken Hall. ^ Bearden. R., in An Ocean Apart: American Artists Abroad. New York: Studio Museum in Harlem. ^ Malone, L., in An Ocean Apart: American Artists Abroad. New York: Studio Museum in Harlem. ^ Williams, J. A., in An Ocean Apart: American Artists Abroad. New York: Studio Museum in Harlem. ^ Driskell, David C., in An Ocean Apart: American Artists Abroad. New York: Studio Museum in Harlem. ^ Mercer, Valerie (1996), Explorations in the City of Light. New York: The Studio Museum in Harlem. ^ I. C. K., (1957), “The Surprise of Painter Tom Sills,” The Village Voice, p. 17. ^ Brown, Kay (2011). "The Emergence of Black Women Artists: The Founding of 'Where We Ar'". NKA Journal of Contemporary African Art. 29: 118–127. ^ Kruger, Barbara (2007)"Kara Walker", Time online. Retrieved 26 July 2007. ^ Kyra E. Hicks (2010), 1.6 Million African American Quilters: Survey, Sites, and a Half-Dozen Art Quilt Blocks. ^ a b c d e f L., Childs, Adrienne. "Material Girls: Contemporary Black Women Artists". The Journal of Modern Craft. 5 (1). ISSN 1749-6772. Romare Bearden, Harry Henderson, A History of African-American Artists. From 1792 to the Present, New York: Pantheon Books, 1993. Jake Adam York, "Medicine as Memory: Radcliffe Bailey at Atlanta's High Museum of Art", Southern Spaces, January 26, 2012. This page was last edited on 27 March 2019, at 12:00 (UTC).